I’m not making New Year’s resolutions this year. I can’t handle the pressure of telling you that I’m writing a book, running a half marathon, going into shopping rehab, cooking family meals, sorting Legos, or cleaning out my closet, because I may or may not do any of it. It’s hard enough to remember to buy bananas at the grocery store. What I really want to do this year is learn to read. To be clear, I know how to read. What I need to learn, or re-learn, is how to make time to read, find the right place to read, and value the act of reading. I didn’t like to read as a kid. Even in high school, I only read what was absolutely necessary. In college, I read constantly, but still not for enjoyment. It wasn’t until my early-twenties when I lived in and around New York City that I learned to enjoy – and fall in love with – reading. I read everything my mom and Oprah told me to, fell head over heels with Bridget Jones, and was a member of an epic, cheese-nibbling, and wine-guzzling book club, for which I hope to one day have an epic, cheese-nibbling, and wine-guzzling reunion. Reading was a cinch at that time of my life, and it wasn’t just because I didn’t have kids with sticky fingers perpetually pulling at my shirt. It was also because of when and where I read – while moving. New Yorkers are always on the go (and rarely at the wheel), so I read all the time. I read on Metro-North when I was in graduate school in Westchester. On Amtrak when I visited my parents in Boston or my sister in Washington, D.C. On the 2/3 when I commuted from home in Brooklyn to work in the West Village or the 4/5 when I needed a 59th Street Bloomingdale’s fix on Saturday afternoons (Shopaholic Mama The Early Years!). I read on trains, subways, buses, planes, and boats! (Okay, maybe not on boats.) I read to and from everywhere. When I moved to Florida, and public transit disappeared, I stopped moving. Even when I was on the go, I was at the wheel, and after so many years of reading en route, picking up a book while stationary – especially at home – was awkward and uncomfortable. There were too many things pulling me away or that I thought were more important, and that was before social media was a thing! Over time, I learned to read without transportation. Mostly, I read while I waited at doctor’s appointments. Thanks to my molar pregnancy, I had plenty of waiting to do, but my Sunshine State reading regimen never quite lived up to what I had in the Big Apple. 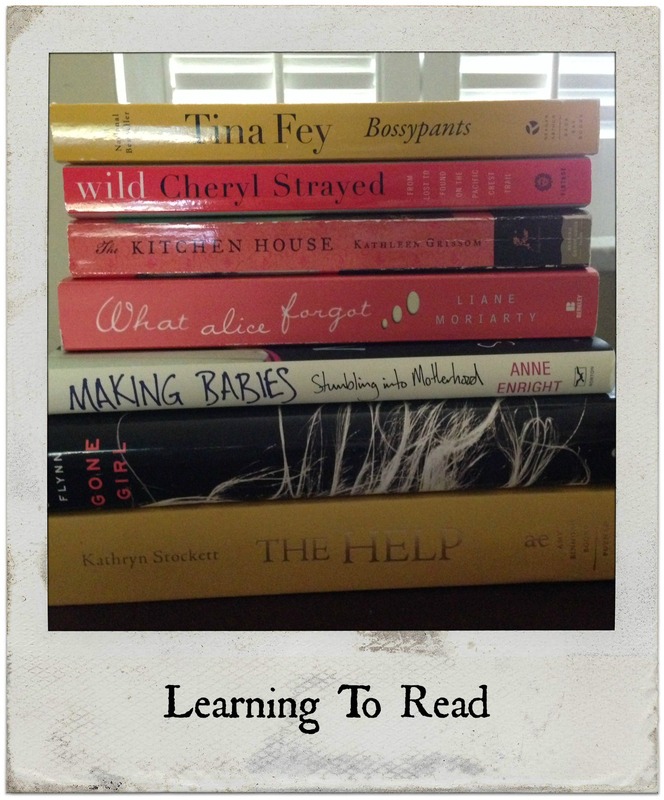 Then, I became a mother, and I estimated that I would read again at some point in my mid 50s. Not to be overly dramatic, I have read a few books in the eight years since my boys were born, but the time I spend reading is erratic at best. It either takes me weeks months to finish (or not finish) a book, or I devour a book in a day or two when an opportunity presents itself (i.e. when I’m away from the kids). Ironically, I feel like I read all the time. It’s just that most of what I read are social media newsfeeds, online news articles, and blogs. It is reading, but it’s not the kind of sweeping novel or compelling memoir reading I long to be doing. My parents stayed with us over winter break, and I’m not exaggerating when I tell you my mom read a book a day. She’s a machine. Considering how much time she also spends watching television and staring at her iPad, her ability to read anywhere and anytime – even over coffee with curlers in her hair at 7:30 in the morning – is admirable. She knows how to read, and she inspired me to think about some things I could do to re-learn how to read. I could schedule time to read. Just like that Friday morning yoga class that’s on my calendar and set to repeat “every week” that I never go to for a million and one reasons, including, but not limited to, that I need to buy bananas. I could read when my kids read. Brilliant! Just like how new moms should sleep when the baby sleeps! Whatevs. I could clear my mind with meditation. If I could just let go of the billion and one things I’m currently thinking about and/or agonizing over, like that fact that I forgot to buy bananas again, I might feel relaxed enough to sit down and read without guilt, anxiety, or distraction. But I would have to schedule that and, well, see the abovementioned Friday morning yoga class. I could spend less time writing. Not only do I wish I had more time carved out to write, which would require me to make a schedule (see aforementioned yoga class and meditation), but also asking me to write less is like asking me to give up my five o’clock glass of wine. That’s bananas (pun intended)! These are all good ideas in theory, but they sound a lot like New Year’s resolutions, and I’ve made it perfectly clear that I won’t engage in such radical behavior this year. The bright (bleak?) side is that 2015 is the year I turn 40, and I already have several over the hill wellness medical appointments lined up, including a repeat thyroid ultrasound, a mammogram, and check-ups with the Runaway Mama Dream Team (i.e. my primary care physician, dermatologist, gynecologist, endocrinologist, gastroenterologist, and hematologist), all of whom excel at running late, which means I’ll have plenty of time to sit, wait, and, God willing, read a book. Or maybe not because I’m not making any promises this year. That, and there might be WiFi. Not only have I already built the habit of reading books anywhere but I am aiming to make it part of my life. I would like you to read Ameircanah and Half of A Yellow Sun by Chimamanda Ngozi Adichie. And i’m 45 with my kids 9 and 13. You can look forward to the peri providing “opportunities” to read when you wake up at 3 am in a bath tub of sweat in your cold room and cannot go back to sleep. Yay.